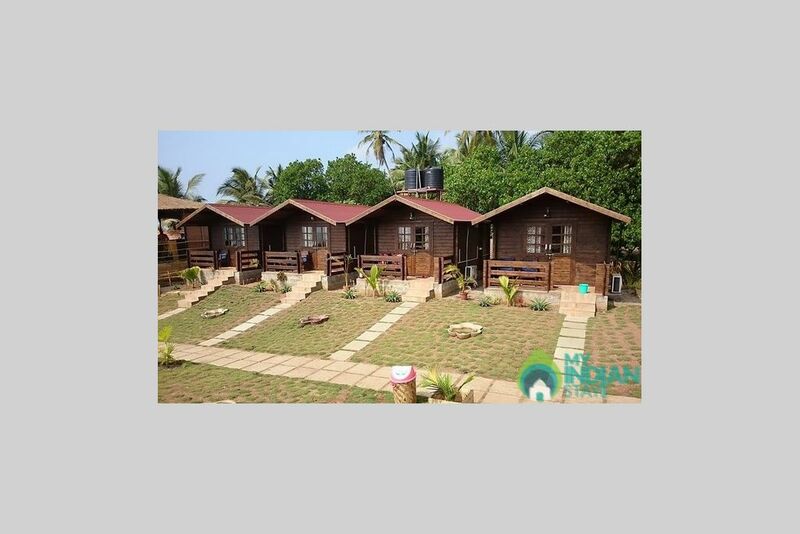 These wooden cottages is deluxe double bedroom with all the amenities like Air condition,T.v. etc with private sitout sea view. This modern deluxe wooden cottages are equipped with air condition, hot water, LED television with satellite channels, comes with free toiletries. It offers a private balcony with the view of Arabian sea where one can enjoy the sunset and cool breeze. 1. All guests are required to provide the hotel with valid photographic proof of identity and proof of address like Passport, Voter ID Card, Driving License and Valid phone/mobile number as per government regulations in force. Pan cards are not acceptable as ID Proof. 2. Check-out time is 12:00 noon. Please inform reception before 9:30 am to check the availability if you would like to extend your stay. Failure to inform that leads to late checkout will incur full day charge. 4. Guests must take good care of their own belongings. The Management will not be held responsible for any loss or damage incurred. 5. No prohibited articles, flammable articles or commercial goods are allowed to be stored inside the room. 6. If any abandoned luggage or lost and found items are not claimed by the guest after a maximum storage period of 30 calendar days, the Management has the right to dispose of these items. 7. Do not bother other guests, such as singing loudly, or any other noisy actions, etc. 8. Please leave your room key at the reception before 3:00 pm if you need your room to be cleaned. Basic cleaning will be done. Towels and Linens are changed on every 3rd day of you stay. Any damage or permanent stain done to linens will be charged accordingly. 9. Inviting strangers into the guest rooms, to use the facilities and or amenities is prohibited. Visitors are not allowed inside the room, guest can use outside sitting area for that. 10. Guests are held responsible for any damage done to the furniture / decoration or other facilities insides the rooms. 11. All electric appliances should be switched off and the windows should be closed when guests go out. 12. Please do not smoke in bed or in any place where smoking presents a fire hazard. 13. Payment should be settled upon check-in or checkout as requested by the Front Desk. 14. Cooking or any ignition is not allowed in the room. 15. Our staff may check the room from time to time. 16. In case of violation of the above regulations or any misconduct as deemed to cause others’ inconvenience or discomfort, the Management reserves the right to ask the guest to leave. Any advance paid will not be refundable. 17. The Management reserves the right to alter or amend the above regulations without any notice. In case of any query, please contact the Front Desk. Overall a positive stay. Rooms were a reasonable size & cleanliness. They were able to accommodate an unexpected additional night’s stay due to a taxi strike. Restaurant & food service was very average. My experience was extremely bad. I had booked my stay from myindianstay three months prior to my journey. My booking was for two ac wooden sea view cottages, which was their best quality rooms. The payment was fully made. In spite of that, after reaching there they have told that myindianstay has sent booking for only one room and all the rooms are full. I drove from mumbai to Arambol with my eighty years old parents and was in a total mess. We were also told that myindianstay is a fraud site and they were having earlier similar issues. After a lot of request they have given one smelly cottage room and one shabby guest house room without any basic facilities. Suddenly at midnight they changed the guesthouse room to another cottage room and we had to shift again. The initial cottage provided was next to a garbage site. The water tap was leaking and the shower did not work. I had a horrible stay there. Had a great time, awesome location. Perfect place, great location, very helpful staff. Assume view from the beautiful cottages. best AC. Very good with connection. probably the best place in Arambol. The location of the hotel is perfect ...just amazing ..loved that ! This host has 25 reviews for other properties. We have a nice beach cottages and guest house just by the beach with AC/Non AC rooms. The huts are of big sized with attached western style bathroom. It has a private sitout place for people to enjoy sunset as well of sea view. What brings you to Arambol? Who all are coming?